As I mentioned at the end of my last post, this series stemmed from an illustration I did of my favorite pop-culture villain. Instead of simply posting this one image, I chose to build up to it, illustrating other favorites, turning it into a top five list. I’m cheating a bit with this post; it’s somewhat of a two-fer, as was my Joker post. But this one has a twist. You see, since I was a child I’ve been a fan of Darth Vader as a villain. Who isn’t? But you don’t have to search too far to find quality images of Vader, both officially licensed art and fan art. Of course I could do my own version, but frankly, I didn’t feel the draw to do so (more puns). But there is another villain that holds near equal standing in my heart, and that is the Kurgan from the 1986 film Highlander, as played by Clancy Brown. I know–cheating, right? This isn’t a real villain. Not entirely, anyway. But this was a labor of love. In addition to altering his already awesome sword into a Kylo Ren-esque light saber, I tweaked his chest plate (Boba Fett style), belt buckle, cod piece, left leg, and left wrist-guard (all Vader style). And then, of course, I placed him on an alien planet. You can’t tell me this sith lord wouldn’t have all others trembling in their dark robes. Darth Maul? Darth Tyranus? Darth Sidious? Pfft. Panzies–the lot of them. None could hold a holo-candle to Darth Kurgan. You think you have what it takes to embrace the Dark Side? 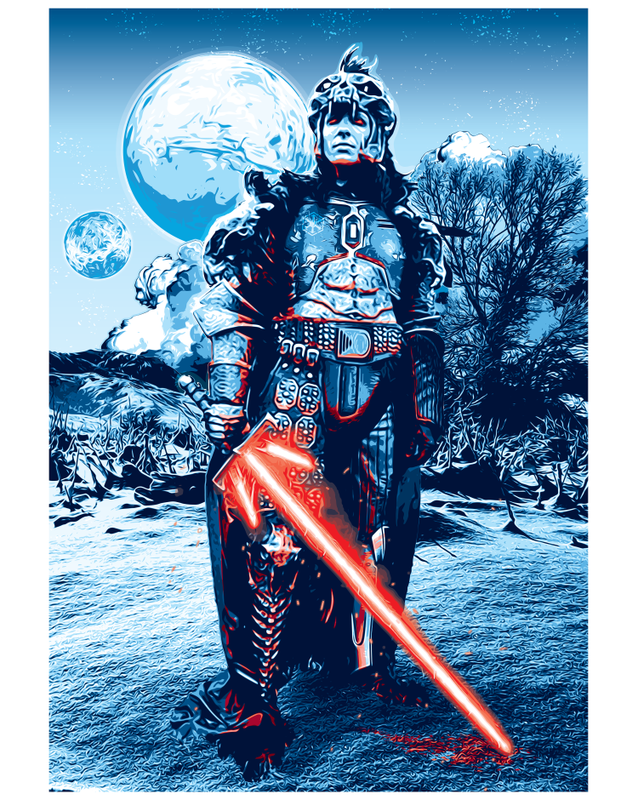 Darth Kurgan is the Dark Side. Why did I choose to combine the two villains? The Force Awakens, that’s why. The saber. The hilt. The scornful posts from the hordes of upset fans across the web decrying the need for such ridiculous adornment to an already perfect weapon. I was not one of these naysayers. No, when I first saw the preview that revealed the new saber, my immediate thought was, “Kurgan.” And from there, the above image had been building in my mind, itching to be made a reality. As I mentioned, I’m a long-time fan of Clancy Brown as the Kurgan. And as I finish this list of top five baddies, I realized that at least three of the five possess a very similar trait (four, if you count Vader): a killer voice. Riddick had it. The Lord of Darkness had it. Vader had it. And Kurgan definitely had it. Part of the plot of Highlander was that the immortal Kurgan had his throat slashed by Sean Connery‘s Egyptian-Spaniard character Juan Sánchez Villa-Lobos Ramírez (great job casting, Russell Mulcahy! Don’t misread that last jab–I really do love this movie. But Clancy Brown was the only actor in the film who was believable in terms of character origins). But the throat slashing forever altered Kurgan’s voice, making it a rich, deep, and gravely audible monstrosity, forever inspiring future actors to imitate his larger-than-life onscreen persona. And speaking of his iconic voice, I should probably point out that Clancy Brown already has many legitimate ties to Star Wars via his extensive work as a voice actor. In addition to random side characters (like stormtroopers and Imperial officers), he voiced the brother of Darth Maul, Savage Opress, in Star Wars: The Clone Wars TV series, and most recently he voiced a rebel sympathizer named Ryder Azadi in Star Wars: Rebels. The animation designers clearly modeled the character of Ryder after Clancy’s visage, as shown below, right. And that completes my Top Five list of favorite pop-culture villains. I hope you’ve enjoyed it. More random posts to come, and more lists of favorites, as well. All the best.